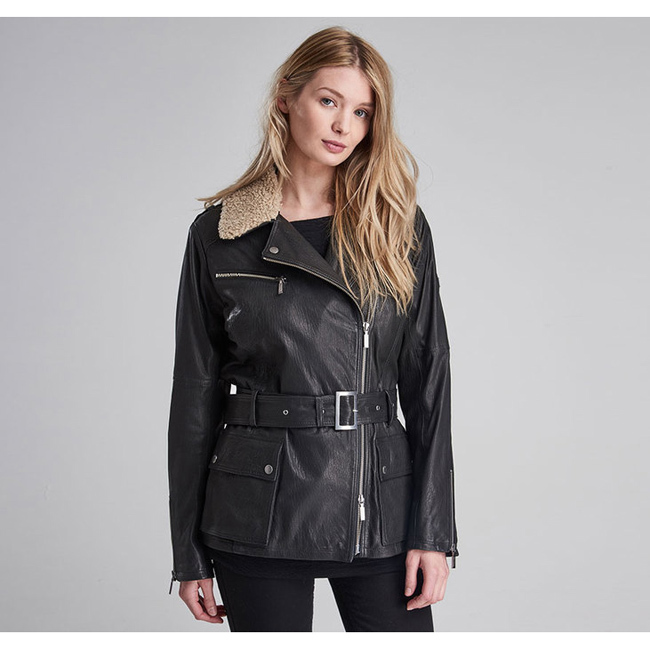 Inspired by Barbour International's biker heritage, this women's leather jacket features an asymmetric front fastening and a detachable borg fleece collar. Exposed zips, stud-close pockets and a waist belt enhance the road-ready aesthetic. Excellent winter jacket. Very water resistant, perfect for activities in the snow. I actually use it skiing, and stayed toasty warm throughout several tumbles. The bottom of the jacket has a very nice elastic band that you can use to tighten the bottom of the jacket to keep snow from going up under your coat in the case of a fall. Item as described, runs a little slim for an XL but all around my husband likes it. Nice and warm! !